What puts you into stress? What helps you relax most deeply? It may not always be what’s most obvious! 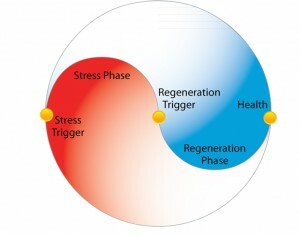 One of the most basic yet powerful self-help tools that META-Health provides is an understanding of the Two Phases of energy and health: sympathetic stress (Phase 1) and parasympathetic regeneration (Phase 2). Where we are, what we think, how we feel and what we do all affect which phase we’re in. More often than not, stress seems to predominate! 1. Lack of presence – Thinking about the past or future: regrets about what’s happened and worries about what might happen. 2. Lack of fuel – Inadequate sleep, water and nutrition, which mean that the body has to ‘run on empty’. 3. Over-stimulation – Spending too much time in busy, noisy, frantic environments, which creates sensory overload. 4. Being on call – Being available to interruption 24-7 through phones, email, social media and more, keeping you on constant alert. 5. Excessive exercise – Healthy in manageable doses, overdoing the cardio or gym work can force the body into a fight or flight state. 6. Resistance – Disliking, resenting or feeling trapped by your daily work or other aspect of life – this inner struggle is often worse than the situation itself! 7. Perfectionism – Feeling that you’re never good enough, taking on too much to please others or needing to prove yourself, which leads to overwhelm. 8. Fighting the clock – Seeing time as the enemy, feeling that there’s too much to do and never enough time. 9. Toxic loading – Filling the body with caffeine, alcohol, drugs or junk food, which means we have more to process and adds inner pressure. 10. Negative interactions – Being triggered by others, blaming and reacting negatively, which causes mental, emotional and physical stress. And there’s one major overlying stressor: Being a human doing – needing to be busy and constantly on the go! 1. Being present – Letting go of past regrets and future anxieties, and focus on what’s happening right now. 2. Taking quality fuel – Ensuring you have adequate sleep, water and air (breathe deeply!) and giving yourself nurturing, nutritious foods that suit your body type. 3. Enjoying peaceful, nurturing environments – Spending time in quiet and tranquil places to wind down from the busy-ness of daily work and life. Environmental change is the reason most people experience symptoms (i.e. go into the regeneration phase) on holiday! It can be as simple as going for a walk in a park. 4. Turning off the technology! – Switching off from the demands, distractions and temptations of the media and what’s happening in others’ lives, enjoying quality time on your own regularly, such as for the first or last hour of the day. 5. Energy-balancing exercise – Enjoying simply stretching and moving the body, or doing holistic practices such as yoga, tai chi or qi gong. 6. Seeing the pluses – Being aware of the many possible different interpretations and even possible benefits of difficult situations, and balancing your focus between the difficulties and what IS good and working in your life. 7. Letting go of expectations – Really? Yes if they are causing you to judge, beat up or berate yourself, or get angry and disappointed with others! Acceptance, forgiveness and being easy on yourself and others for the ‘mistakes’ we make leads to an easier, happier life. 8. Being a time dove – Practising patience and being at ease with that construct we call time. 9. Meditation – Having a regular meditative, contemplative or spiritual practice, fuelling yourself through peace. 10. Creative fulfilment – Expressing yourself in ways you enjoy, through movement, art, music or through loving the work you do. And above all, remembering that you’re a human being!